Tipper O'Brien, right, started his company Greendals to try to use some of the tires littering Missouri to create eco-friendly sandals. A St. Louis native is taking discarded tires out of the state's ecosystem — and putting them onto his customers' feet. SLU High School and Mizzou graduate Tipper O’Brien set off out to turn discarded tires into sandals in an effort to help clean up Missouri. The resulting sandals, marketed as "Greendals," should come with a 40,000 mile warranty, O'Brien jokes. O’Brien works out of the basement of his Benton Park home to make and market Greendals, along with two of his friends. Figuring out how to turn a tire into a sandal wasn't easy, he says. “Its a long process. We’ve been working on it for years and it's finally coming together,” O’Brien says. 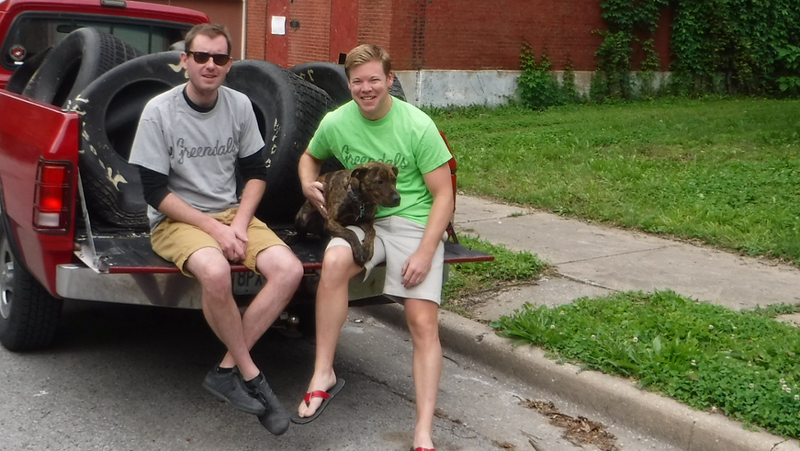 The tires used by the Greendals teams are found in rivers, junkyards and across Missouri. Greendals receives many of its tire donations from the Missouri Stream Team, a group of volunteers who spend time pulling trash from the state’s many rivers. A portion of all Greendals’ profits go back to Missouri’s Stream Team. O’Brien says he first noticed Missouri’s litter problem while running cross-country at Mizzou. “We used to do an occasional run down by the Missouri River. It was amazing to see how much trash washes up on the side of the river,” O’Brien says. O’Brien says a major goal of his company is to give consumers a way to help the environment while also purchasing a quality product. The flip flop-style sandals may just be the beginning; O'Brien says he hopes to release different styles in the future, all using scavenged trash. Greendals can be purchased for $37.99 each and are offered in several different colors on the company's website.